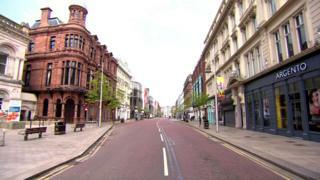 A plan to extend trading hours on 18 Sundays in Belfast has been heavily defeated in a vote at the city council. The move would have been permitted had the council designated all or part of the city a holiday resort under 1997 legislation. A council committee voted 12-3 against the holiday designation, with Sinn Féin, the SDLP and DUP all against. A recent public consultation found a majority in favour of longer opening hours during March to September. Of 2,471 responses from organisations and individuals, 62% supported the idea. Retail groups were split on the idea and the shop workers' union, Usdaw, opposed it. Some shop workers protested against the plan outside city hall on Friday morning. The decision not to extend opening hours has been welcomed by Retail NI. "This would have given a further unfair competitive advantage to large supermarkets and disadvantaged local small shops, whose Sunday morning trade is vital for their survival," the group's Glyn Roberts said. "Furthermore this vote puts down an important marker to the other 10 local councils not to consider relaxing Sunday trading through the back door of resort status." Paddy Lillis, Usdaw's deputy general secretary, gave evidence to the committee on Friday. "We are delighted that the committee listened to our evidence based case and backed our members who remain absolutely opposed to extended Sunday trading," he said. "The current Sunday trading arrangements are a fair compromise, which has worked well for 20 years, and gives everyone a little bit of what they want." However, Gordon McElroy, president of Belfast Chamber of Trade and Commerce said he was disappointed by the decision. "We believe that extended Sunday trading would positively benefit trade in the city, which would have a cumulative effect across the whole of Northern Ireland," he said. "The chamber will continue to lobby for Belfast to be designated a holiday resort, which we believe will not only help attract additional visitors to the city, but provide life and vitality to our city for those who currently visit but are frustrated by the lack of business and attractions which are open on Sunday's before 1pm."